The initiative, focused on investigators from Memorial Sloan Kettering’s Geoffrey Beene Cancer Research Center, highlights the critical need for funding scientific research. The Geoffrey Beene Foundation is featuring six Memorial Sloan Kettering researchers in its current Rock Stars of Science™ campaign. Now in its third year, the campaign is showcasing scientists exclusively from Memorial Sloan Kettering’s Geoffrey Beene Cancer Research Center. 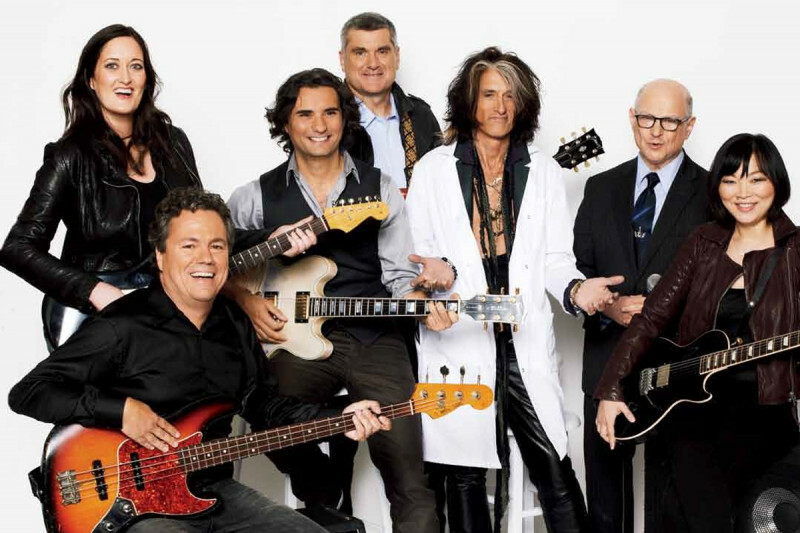 The scientists are featured in GQ magazine’s December “Men of the Year” issue, along with Aerosmith lead guitarist Joe Perry, named the founding father of the campaign. Rock Stars of Science™ aims to showcase the critical need for funding scientific research. This year’s videos and public service announcements feature Memorial Sloan Kettering President and CEO Craig B. Thompson, Geoffrey Beene Cancer Research Center Chair Scott W. Lowe, Deputy Physician-in-Chief of Breast Cancer Programs Larry Norton, former Geoffrey Beene Junior Faculty Chair and cancer biologist Johanna Joyce, and current Geoffrey Beene Junior Faculty Chairs cancer biologist Andrea Ventura and physician-scientist Ping Chi. “The Geoffrey Beene Cancer Research Center takes a new approach to modern cancer research, with the ultimate goal of translating basic science discoveries into new ways of thinking about treating cancer,” Dr. Lowe says. The Geoffrey Beene Cancer Research Center was established at Memorial Sloan Kettering in 2006 and has continued to be funded annually by the Geoffrey Beene Foundation and Geoffrey Beene, LLC. The goal of Geoffrey Beene is to provide direct support for revolutionary new cancer research, ultimately making cancer a more manageable, and potentially curable, disease. More than $126 million to date has been awarded to Memorial Sloan Kettering for the Geoffrey Beene Cancer Research Center and projects pursued by its scientists. The center brings together laboratory investigators from the Sloan Kettering Institute’s Cancer Biology and Genetics Program and physician-scientists from the Human Oncology and Pathogenesis Program, in an effort to speed the translation of research from the lab to patients in the clinic. Learn more about the Rock Stars of Science™ and watch videos about their research. Well done for all your work to date. rock on,amazing people,how do they do it? Great job, guys - rock on! Thank You so much guys!!!! !You rule!!!!! Well deserved ...Guys you ROCK THE WORLD !!! Many Thanks to you all! Thank-U! Folks like you have allowed me more time with ill family members--very precious time. In addition to giving people more time with loved ones, the quality of life is better! You are the ones we should be grateful for and happy to have in our corner. Yes! We need for kids to admire scientists and researchers, not obnoxious, overpaid athletes and pop music stars. I am proud of all of you and the hard work you do each and every day. What would this world be like without you. Keep it up. Thank you for honoring some real heroes! I wish you great success. The world needs this. As a former researcher who went back to teaching, I can only say "Hail to thee!" Research is time consuming beyond belief, pays very little, given the level of education involved, and is rife with frustration. It is all worth it, however, when a "Eureka!" moment occurs, and new information is proven. Thanks for doing this for the planet!! Many heroes such as yourselves will never be household words, but we love you just the same! Thanks for dedicating your lives to helping others. You truly make a difference! Thank you all for all the hard work you do without faltering . you all make all the difference in the world to your patients. You might not be rock stars but you sure are the real heroes up there in the frontline facing the beast ... and I`m sure you can sleep well knowing you are fighting to save lives and ease pain...my hat off to you all ! Thank you. It sadden's me, that we give more money a week to a footballer than a doctor, scientist, doctor or researcher. And while sit at the alter of Debt, we will never truly be free. So much talent is either wasted or not even recognized. So lets hope this help a little bit in getting the recognition put in the right place. Thank you for helping to make everyone's life better.....rock on! I am a survivor, and I know I wouldn't be here today but for the tireless efforts of researchers like yourselves. Thank you! I hope you look back on your life and be proud of your accomplishments making a positive difference in the world! I am a cancer survivor and my second-born daughter is a survivor, all because of the work you people have done. Bless you as you keep on doing what you're doing. absolutely some of the most note-worthy news I've read in a long time...thank you so much for bringing a much needed smile to my heart and face!! thanks a million your our x factor. thank you so much for your hard work. My dad just passed of cancer and I appreciate anyone will to work for the cause. You get my thumbs up!! You guys rock!! I would buy a ticket to see you stars perform your miracles!! Thank you all for your brains and hard work for us. I am aware of many accomplishments of scientists in different areas of medical research and applaud and admire each person involved. Each discovery is a step forward to helping pain and suffering especially of a disease that affects everyone. My congratulations and thanks to all people involved worldwide in the research. My disappointment is, and will continue to be, that much of the research which genuinely works, is not available as it is too expensive, although I do understand the financial limitations. This means that insurance companies and governments will not pay for them. I am also saddened that international co-operation does not always exist especially with a country such as Israel is boycotted by many scientists despite having some of the most brilliant brains in the world who are happy to share research and do so freely as well as helping people from all around the world, regardless of ethnic or religious origin, for free. There should be no boundaries or limitations just for the sake of publishing a paper or for unwarranted bigotry. In the meantime, I would like to thank and congratulate each person involved in research. Thank you. As a Long-term Hodgkins survivor I am so grateful. Thank you, for the hard work that you all do.